339 recipes, 113 hints and 55 color photos! Note: These files can take a while to download. 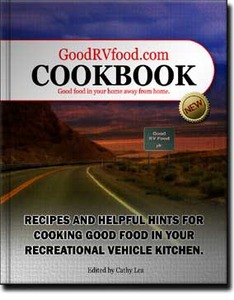 The recipes and hints found in this cookbook are published directly from the GoodRVfood.com web site. This cookbook is dedicated to anyone that cooks in the limited space of a recreational vehicle (RV) kitchen that is not likely to have room for complicated preparation or large cooking appliances, like an oven. All of our recipes are simple to prepare, easy to cook and this often means a snap to clean up. In the neighborly spirit common to most travelers these recipes are kindly shared with us and in turn we kindly share them with you. This is a labor of love for us. 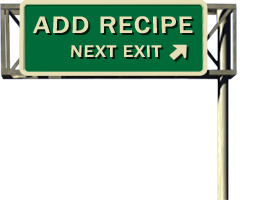 All we ask is that you return the favor and share some of your favorite recipes and hints with the rest of us by sending your favorite RV recipe or food related hint. If you need a paper version of our cookbook give the PDF file to your local print shop or copy shop. Our Creative Commons license allows you to make all the personal copies you want. We do not officially offer a paper version of our cookbook because the electronic version (PDF) automatically updates here on the web site every time the web site changes to keep it current with the latest recipes and hints from our wonderful contributors. We make this cookbook available for download because a working Internet connection is not always available when you want to cook good food on the road. You are encouraged to share this FREE cookbook with everyone you meet and have them do the same. Happy travels and good cooking! Hurry! Send more recipes, hints and tips today to be included in our next cookbook. Help other recreational vehicle travelers cook better food with less effort.